I love to cook and bake but on certain nights of the week, I don't have time to do it from scratch. On these particular nights, I turn to dinners that are in my freezer. When I make and serve frozen dinners to my family, I want them to taste like they were made from scratch, contain no preservatives and I want them to be quick and easy in their preparation. One company that I turn to for frozen family dinners in Michael Angelo's who makes a wide variety of great tasting frozen family dinners. In their foodie product line-up, you will find: Meat Lasagna, Eggplant Parmesan, Vegetable Lasagna, Chicken Parmesan, Shrimp Scampi, Chicken Piccata, Baked Ziti with Meatballs, Four Cheese Lasagna, Manicotti, plus more! About Michael Angelo's: The company was founded in 1982 in San Diego and has been based in Austin, Texas since 1993. All of the Michael Angelo's frozen Italian meals are prepared with love, using the highest quality ingredients. You can find the company's products in grocery stores, club stores and natural food stores across America. Once the frozen dinner has been made, it is quickly shipped to stores within 36 hours through a made-to-order process that eliminates the need for a warehouse and guarantees freshness unmatched in the frozen food aisle. My Review: I was sent a coupon to go out and pick up any Michael Angelo's product and we decided to try their Meat Lasagna dinner. This is a complete frozen dinner that you keep frozen until ready-to-use. It contains no preservatives and is made with imported Pecorino Romano Cheese and Vine-Ripened Tomatoes. It is made in small batches and made from scratch which ensures an exceptional quality product. When you look at the ingredients list printed right on the box, you will recognize every ingredient on the list. There are no funky names or funky ingredients that you wouldn't recognize and I really appreciate that. Now, you might be thinking that this dinner is high in calories, but it's not! There are 290 calories per serving with 90 calories being from fat. Per serving, this dinner has a lot less calories than traditional fast food! Yeah! We followed the directions on the side of the box and prepared our dinner in the microwave oven which took 14 - 17 minutes. While it was cooking, I prepared some garden salads and made some Texas Toast. Once done, I remove it from the heating tray and placed it onto our dinner plates. The smell was absolutely amazing and we couldn't wait to "dig-in". We sat down together as a family and enjoyed a really nice dinner together. My hubby and daughter were raving about this Michael Angelo's Meat Lasagna and both said it tasted better than my homemade lasagna! The lasagna noodles were tender, but not rubbery. The meat sauce was flavorful and had just the right amount of seasonings. The cheese was melty, gooey and had a wonderful taste! Yummy! 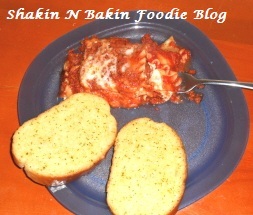 Overall, we loved this lasagna dinner and since reviewing it...we have purchased three more! If you love to serve frozen dinners to your family on those busy nights when you don't have time to cook from scratch, Michael Angelo's frozen dinners are definitely the way to go! We give this dinner a huge 2-spoons (2-thumbs) up! Michael Angelo's Trip to Italy Sweepstakes Info: Michael Angelo’s Gourmet Foods – the family owned and operated maker of fresh and authentic frozen Italian meals – is offering one grand prize winner an eight-day trip for two through the Trip to Italy sweepstakes. Winners will stay in a private villa with the Michael Angelo’s family, and will tour the region throughout the trip, including an exclusive event at Castello Banfi. Founder and CEO Michael and his mom Sara spend a great deal of time in Italy, and they make great tour guides! You can enter on their site and get all of the details there. Yeah!!!! Hello...I don't want to enter, just wanted to say people need to make sure it is available in their area...It is not in mine..Thanks!! I entered the Bath and Body Products from Whish giveaway. I entered the Filet Mignon giveaway. I entered the Gordon's giveaway. I entered the Doll Clothes Superstore giveaway. I entered the Golden Age Cheese giveaway.